Thanks for all your emails yesterday in response to the posts about Prince Harry and Meghan Markle’s royal baby. Thanks also for all your predictions/suggestions in response to Duana’s post about potential royal baby names. One of the most interesting prediction-suggestions came from a reader called “F” who really wants it to be “Rosa”. As in English Rose. And for Rosa Parks. Thoughts? Harry and Royal Meghan stepped out for several engagements today/yesterday on their first day of their tour of Australia, Fiji, Tonga, and New Zealand. 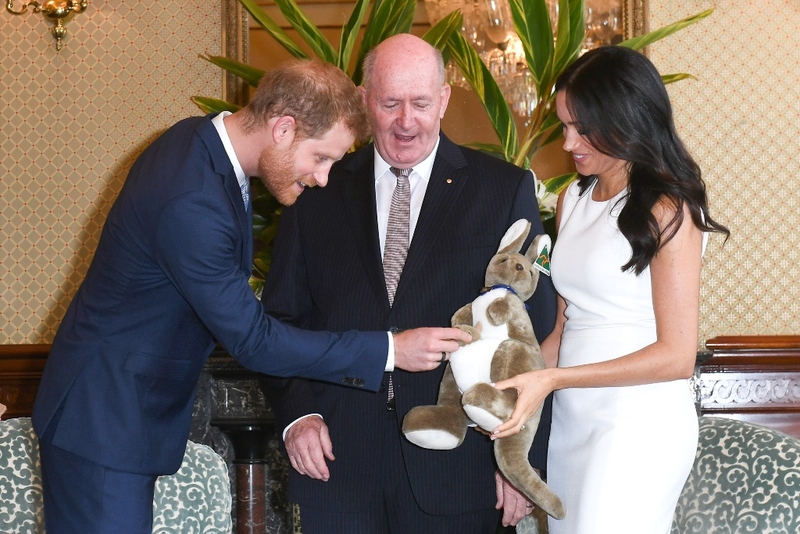 And right away the baby was the main event as they were presented with a toy kangaroo and joey by Governor General Peter Cosgrove and Lynne Cosgrove at Admiralty House. “That’s so cute! It’s our first baby gift!” is how Meghan reacted. So now that the secret is out, they’re definitely talking about it. They’re giddy in that way where they can’t help talking about it, both of them, and not just her. More about this later including photos from their various appearances. As you can see though, there’s no more need for big coats. As I wrote yesterday, the news was revealed just in time for this trip, maximising the exposure both for the tour and the upcoming Invictus Games. Very well-executed PR.